CHRISTIANITY IS OLD. Really old. I think we all know this. We know that Christians have been at this for over 2,000 years. We, if we are Westerners, know that the setting into which Christianity was born looks very little like the setting we find ourselves in today. But most of the time our Christian walk is based on the things we hold in common with the first Christians—the doctrines that have endured through time that we confess each Sunday. Sometimes it helps us to think about the context in which those doctrines were first confessed. In 2003 Christian History did an issue (no. 79, African Apostles) on the nineteenth- and twentieth-century explosion of Christian missions in Africa—a story with high drama, many heroes, and much faithful witness. But many of us are here because mission went out from Africa in the first place. So many early church fathers and mothers, so many martyrs, so many writers, so many worshipers came from the African church. From cities like Carthage, Alexandria, and Hippo, and the regions that are now Ethiopia, Algeria, Tunisia, Egypt, and Libya came heroes, martyrs, bishops, monks, and theologians—Tertullian, Augustine, Cyprian, Origen, Perpetua, Anthony, Maurice, Frumentius, and Syncletica. 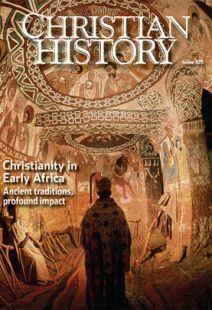 In this issue, we will walk through everything from ancient archaeological ruins to modern-day worshiping communities of Coptic Christians as we regain touch with the African context. And we will hear how this heritage is being rediscovered and promoted today. The lessons from these stories are many, but two stand out. The first is the high regard in which early African believers held the Bible. Allegorical interpretation of Scripture was born in Alexandria, and it was born out of a desire to emphasize that the whole Bible—Old Testament and New, easy parts and hard—speak of our life in Christ. (For an example of this in action, see “The Bible’s story is our story,” pp. 24–28.) Later, John Cassian (see “Become completely as fire,” pp. 15–17) divided this allegorical approach into no fewer than three senses that complemented the literal meaning. “Jerusalem,” on this model, is all at once the literal city, the church, the human soul, and the heavenly city we all desire. The whole Bible was for the whole Christian and the whole church. The second lesson is the high regard in which early African believers held the Church—with a capital “C.” Christ’s command for unity was serious, visible, and structural. Schism would not only (before Christianity was tolerated) make resistance to persecution harder, but it was also a theological problem (“See how these Christians love one another,” pp. 29–33). It broke the bonds of love and doctrinal accountability. “Catholic” meant “universal,” and it meant that precisely because these Christians desired the church to be visibly universal and comprehensive, where the bishops of every city would see themselves and their teachings as accountable to each other. We may look back and say it was an impossible ideal—but before we do so, we should be challenged by these African believers’ deep assumption that it was not only possible, but necessary.